Ever since the International Olympic Committee (IOC) announced a shortlist of new sports to be considered for inclusion in the 2020 Games, speculation on the outcome has been a major discussion point. The very recent exclusion of Wrestling has also been controversial and adds to the enormous publicity surrounding these Olympic developments. Wakeboard is one of the selected sports for the 2020 Games. As a youth focused lifestyle board sport, it would certainly add a totally new dimension to the Olympics. Board sports are thriving in all forms with Snowboard achieving enormous success in the past Winter Games. 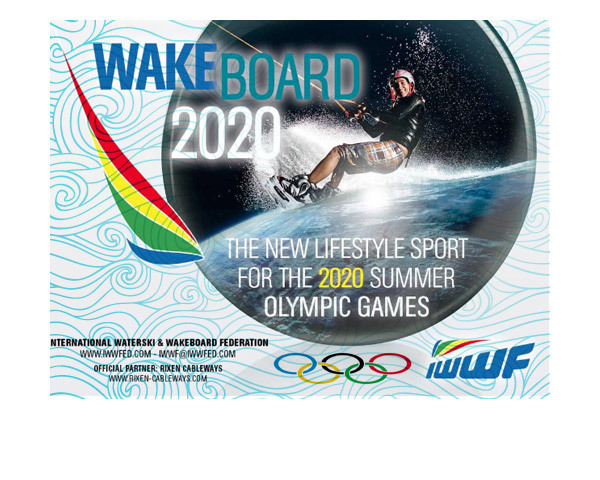 The International Waterski & Wakeboard Federation (IWWF) launched a major supporting campaign some time ago under the heading of WAKEBOARD 2020 VISION to bring Wakeboard to the Games. The IWWF will make a final presentation to the IOC Executive Board in St Petersburg, Russia, at the end of May. They will make their final selection in September. A new dimension has now been added to the current worldwide boom in Cable Wakeboard installations. The latest development is that the Olympic Rowing lakes in both China's Olympic Beijing Shunyi Lake and Spain's Barcelona Olympic Rowing Lake have now both decided to feature Wakeboard as special attractions to benefit from the world-wide boom. Using existing facilities makes the development a very cost effective one. It is also an environmentally friendly addition. With new Wakeboard Cable facilities also opened recently in Egypt, Ireland, Australia, USA, New Zealand, etc., the WAKEBOARD 2020 VISION programme of the IWWF appears to be gathering enormous momentum. Wakeboard also featured at the 37th IWWF World Cup Stop in Palembang Indonesia two weeks ago, will appear at Beijing's Olympic Lake on June 8/10, in the World Games in Cali Colombia on July 25/Aug 4 and at the Wakeboard World Championships in Busan South Korea on August 28/Sept 1.